Obama: Politician, pop icon -- or both? WASHINGTON (CNN) -- In a framed photo for sale at one of the many souvenir shops in Washington, Barack Obama looks more like a movie star than a politician as he exits a vehicle in a black suit, red tie and sunglasses. Hats, buttons and shirts are among the most popular items at the store where Vicki Starcher works. The caption of the image, showcased in the front window of the store, reads, "Presidential Cool." "He's a man of the people," said Vicki Starcher, who traveled from Norfolk, Virginia, to help set up the temporary store during the inauguration. "I think the difference is with Obama, he has so much of the younger backing, BET ... and the hip-hop community," co-worker Jasmine Robinson chimed in. Ebony magazine listed Obama was as one of the "Top 25 Coolest Brothers of All Time," alongside Tupac Shakur, Muhammad Ali, Jay-Z and Marvin Gaye. The memorabilia decorating the streets of Washington and the images on magazine covers are a symbol that, to much of America, Obama is more than just the next president. He's also cool. Watch the historic inauguration of Barack Obama with CNN and the best political team on TV! It's difficult to pinpoint what lends to a label as elusive as cool, but experts say in Obama's case -- it's multifaceted, and if he's not careful, it could be temporary. John Quelch, the senior associate dean at Harvard Business School and co-author of "Greater Good: How Good Marketing Makes for Better Democracy," says there are four key components to Obama's cool: he's street cool, family cool, technology cool and culture cool. That cultural coolness -- people are comfortable seeing Obama on the basketball court, in the Oval Office and on their T-shirts -- is something to which Amy Maniatis, the vice president of marketing for CafePress, can testify. 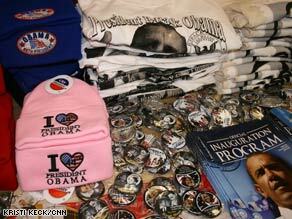 "Never before have we seen images of a president -- his face, his likeness -- on so many graphic T-shirts. It's never been so hip to wear a president on your T-shirts," she said. Typically during election seasons, CafePress, an online store specializing in user-generated T-shirts, sees a huge amount of political sales leading up to November 4 and a drop after the election, she said. "What the phenomenon that we've seen with Obama is the 'Obama the politician,' 'Obama the political candidate' sales are over but it's been replaced with 'Obama the pop culture icon,' " she said, pointing out that since the election, the number of Obama products for sale has continued to grow. "It's almost like what you've seen with Che Guevara or Eva Peron, when a political leader has this coolness factor that goes well beyond their political beliefs. They represent something even bigger." Obama as a T-shirt design, Maniatis said, translates to something with a '60s vibe. Obama designs online and in Washington include images such as peace signs, rainbows and doves. "He seems to have settled in the hearts and minds ... as representing optimism and change. His campaign of hope and change really stuck with folks, and you see it in the designs that are being fed back," she said. "It's as if folks are already nostalgic about this time." Starcher said people are snatching up the stores' T-shirts, buttons and hats. "There is really no true word to explain what this man is about to do for us and the entire country. It's a long time coming, just like the shirt says," she said, pointing to one of the items for sale as a recording of an Obama speech played in the background. In Washington, the Democratic president's marketability is being used to sell everything from golf balls to commemorative plates to drink specials this week. Mitch Prinstein, a professor and director of Clinical Psychology and the University of North Carolina, says Obama has ideas that people really like, and "as the representative and personification of those ideas, that makes him pretty cool." Prinstein said Americans have "a hard time finding high levels of intelligence being cool if they're not also conveyed with a sense of every-person likability." While former Democratic presidential nominees Al Gore and John Kerry were both extremely intelligent, they lacked likability, Prinstein said. Obama has been able to capture both reputations, he said. "He is a likeable character, but he also is extremely qualified. I think those are the factors that make a politician cool," he said. Obama has established himself as cool, for now, but continued coolness isn't guaranteed. Obama must be careful to not lose the close connection he has developed with his grassroots supporters, Prinstein said. "I think that he's going to have to keep the really difficult balance between somehow being inside Washington enough to be effective in instituting change but at the same time not be so much of an insider that he loses touch with the American people, and that's probably a really difficult balance to achieve," he said. Obama's lifestyle, campaign and composure have helped him developed his reputation for being cool, but Obama's ability to keep the reputation is now up to him, Quelch said. "Any politician lives or dies on the basis of his performance in office -- so what is perceived by the American people and the media as a poor performance will negate the cool image," he said. But for supporters such as Starcher, there's no doubt that with Obama in the White House, things will only get better. "We need change. We need somebody fresh. We need somebody who's going to use his power to the utmost in his office. We know, we feel, we know, we believe -- he's going to do that," she said.